Producing and consuming in unsustainable ways drives climate change and the destruction of the environment. People everywhere are consuming more than ever before, but much of this is concentrated in the wealthiest countries and populations. For 767 million people living on less than $1 a day, the problem is not consuming too much, but consuming too little, often barely enough to survive. Responsible consumption and production depends in part on reducing overconsumption. It is important to shift production processes so that at each stage they are sustainable and avoid overuse of natural resources. One area where a better balance could be struck is public transportation. Private vehicles remain a heavily consumed good that makes significant contributions to emissions. Evidence suggests that women are less likely to drive than men, and more reliant on public transport. Investment in energy efficient modes could therefore yield large benefits for the environment and for women. 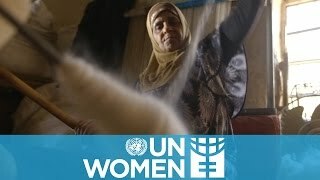 UN Women acts to redress imbalanced consumption and production by advocating for policy reforms that back equitable ownership and use of property and resources. By making public transportation inclusive and safe, by hiring women bus drivers like Pelin Aslantaş, the city of Edirne, Turkey, is making strides towards reducing carbon footprints made by cars in the city. Rising deforestation presents a major threat to the livelihood of women who work in shea butter production. A UN Women- programme, in partnership with the Government of Côte d'Ivoire has provided a climate-smart solution to reducing deforestation, while bolstering rural women’s economic empowerment. The “Good Garden” in Serbia not only a social enterprise for growing organic vegetables but also a training centre for for women survivors of domestic violence who wish to get involved in this sustainable farming method. With support from UN Women’s Fund for Gender Equality, the Society for the Protection of Nature in Lebanon is supporting rural Lebanese women and local municipalities to become partners and champions of the environment by promoting local ownership of sustainable resource management.